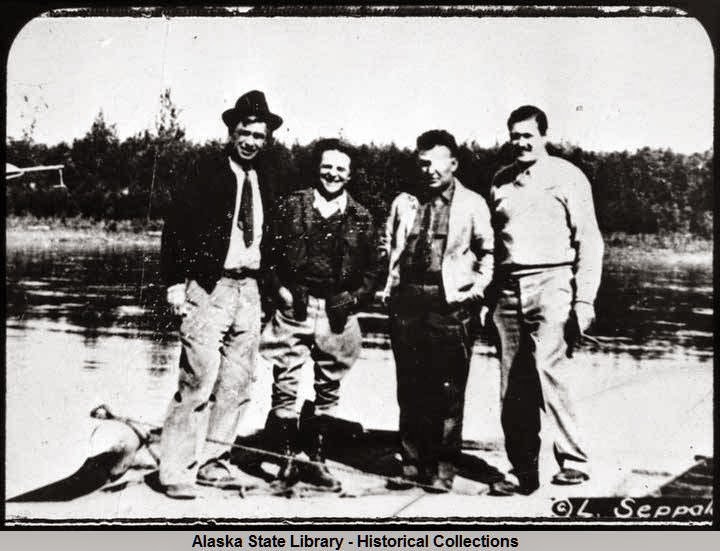 The Alaska Native Studies Blog: "America's Ambassadors of Goodwill:" Cherokee Will Rogers and Wiley Ford in Alaska, 1935. "America's Ambassadors of Goodwill:" Cherokee Will Rogers and Wiley Ford in Alaska, 1935. Will Rogers standing on airplane wing while Wiley Post signs autographs in Fairbanks, 1935. Humorist Will Rogers once noted about life, "We are all here for a spell; get all the good laughs you can." In 1935 the public knew Cherokee writer and performer Will Rogers as one of the most famous, smart, and jovial celebrities in the world. Born in 1879 of a distinguished Native family in Cherokee Nation, Rogers went on to pen over 4,000 newspaper articles and star in more than 70 films. 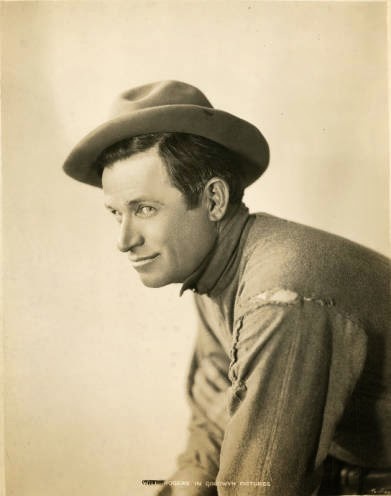 Coming to international fame through performing as a cowboy in the Ziegfeld Follies on Broadway in New York, he went on to be one of the nation's trusted analyst on American political life. 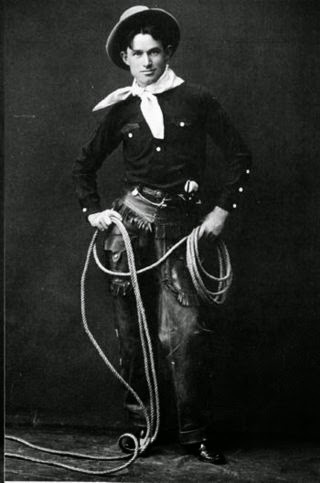 Rogers, with lariat, in his 20s as a Vaudeville performer. As a young man Rogers held a thirst for travel. Leaving Cherokee Nation, and Oklahoma, in his early 20s he worked as a ranch hand in South America and Africa. Later returning to the United States he enhanced those cowboy skills and learned to become a trick rope performer, working at circuses and traveling shows. By 1916 he had transformed his career from basic physical entertainment into one that involved much political satire. Within 2 years of changing his act he was heavily involved in films, starring in a host of silent and talking movies. With adages such as, "Everything is funny as long as it is happening to somebody else," or "An onion can make people cry, but there has never been a vegetable invented to make them laugh,"his wise comments could prove to be light-hearted and in good spirit. Rogers however could also delve into more politically directed expressions like, "Be thankful we're not getting all the government we're paying for," and "Diplomacy is the art of saying 'Nice doggie' until you can find a rock." Though in his newspaper columns he did assert some racially controversial language once or twice, Rogers proved to be a thoughtful and well-meaning voice for an adoring public. At the time, he was one of but a handful of people in the world whose life was developing into what we know today as that of an internationally known celebrity. One could think of him as somewhere between Mark Twain in the nineteenth century and Stephen Colbert in the twenty-first. His love of travel continued as his fame rose to new heights. Through the 1920s and 30s he spent years circulating through the United States, Asia, and South America, hosting dinners and lecturing on political issues. Upon what he learned from these experiences he once joked, "A humorist entertains, a lecturer annoys. "He was also a committed social activist and worked for countless fundraisers for humanitarian causes, like Bob Hope. In 1935 he and his dear friend pilot Wiley Post set upon a tour from the United States west coast up through Siberia, scouting out a possible international mail route. Rogers used the trip for material for his newspaper articles. 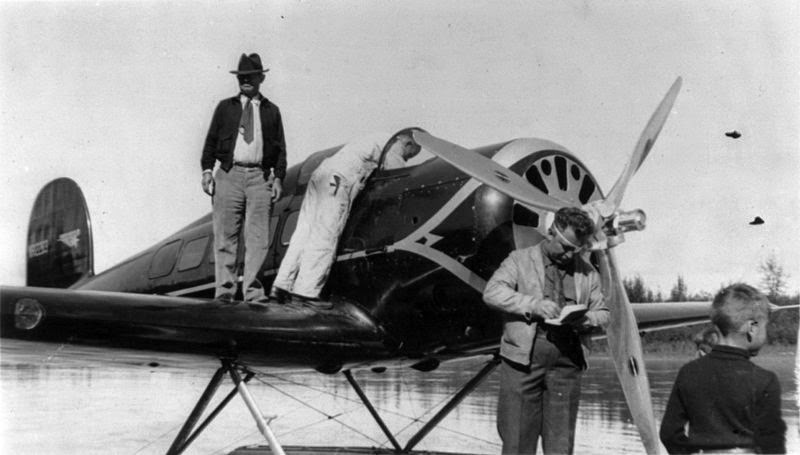 Roger's friend, the celebrated pilot Wiley Post was the first person to fly solo around the world. Texas born in 1898, he fell in love with planes by the age of 15 after seeing one fly through the air around his hometown. Intending to become an military pilot, World War I ended before he could finish training, and from there he returned to Texas where he worked in the oil fields. In the conclusion of a brief term under incarceration he also went to work in a flying circus. Losing his right eye amidst an accident when in the oil fields, an insurance settlement allowed him to purchase a plane. He joined traveling air shows and this work is believed to be the way Post and Rogers came to be close friends. As time went on, Post avidly sought to advance the field of aviation as a whole. Post always flew higher and further into the sky. In fact, he is credited for locating the high altitude air currents known as jet streams that are now used by planes in everyday travel as highways. During his high altitude experiments, technicians invented many prototype pressure suits. A quick google search of his name will reveal some interesting inventions he wore as he tested how high he could thrust into the sky. "Will Rogers, Wiley Post, and two other men." "Four men stand on a dock; man wearing a hat is Will Rogers; man with eye patch is Wiley Post." ASL-P384-1263 In Fairbanks. On August 15 1935, shortly after leaving north from Fairbanks, Rogers and Post lost their lives when their plane crashed near Point Barrow, Alaska. The tragic event marked a horrid loss for their families and for general public who looked towards these two in admiration. For both had lead extraordinary lives in taking part in the construction of the the globally-connected world we now take for granted on a day-to-day basis. 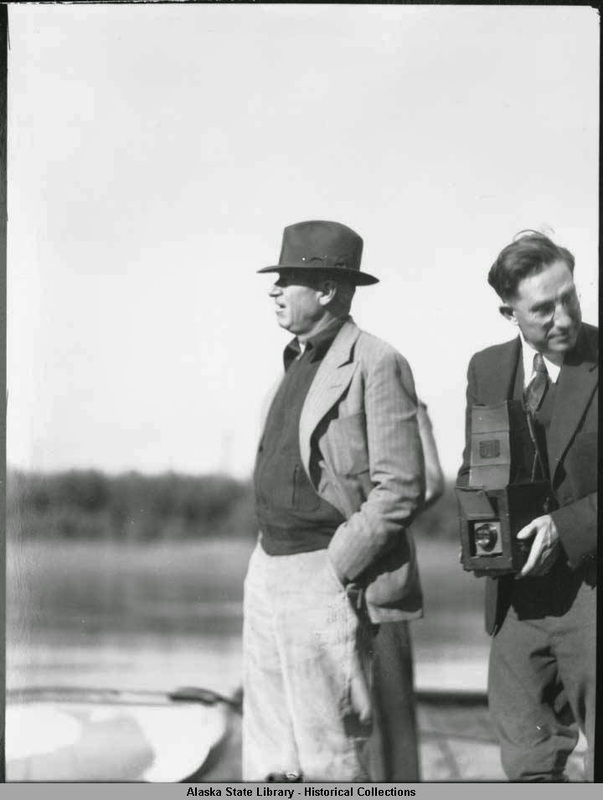 Rogers and Post in Fairbanks August 1935. 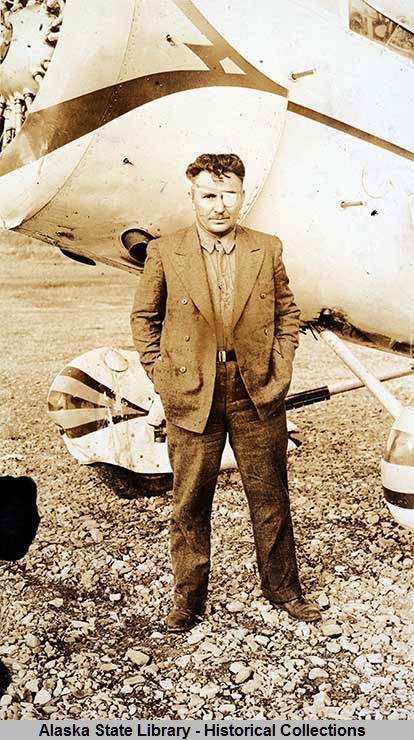 Wiley Post's work in advancing aviation as an effective means of travel contributed to how airplanes would become an important thread tying together the modern world system. 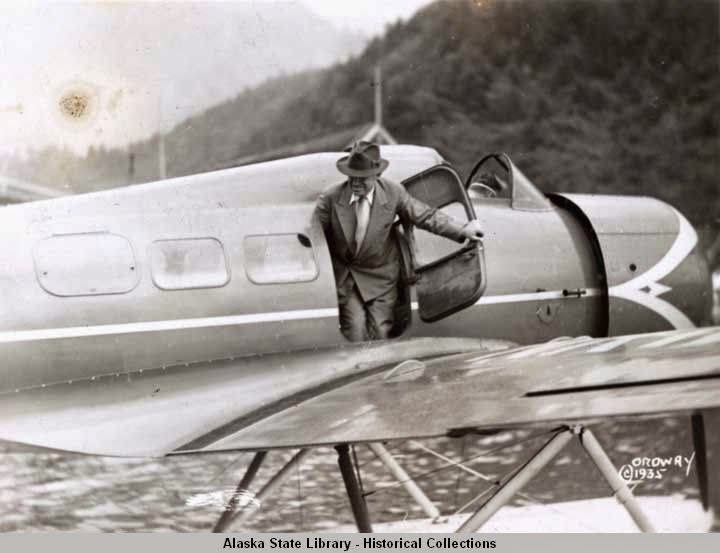 In the 20th century Alaska pilots were greatly esteemed among Native people since most villages and towns required air service for the transportation of goods and people. In fact, I can recall an elder once proudly announcing that his grandson, who was 13 at the time, would someday be a pilot. One could make the case that air travel has played an important role in the making of Alaska as one region and as a naturalized part of the nation. That is, those of us from Alaska know the great distances we have to travel between the town, village, or city were are from and the contiguous part of the United States. When I was growing up Fairbanks and Juneau seemed just as distant from Kodiak as Seattle or Tokyo. In this way, airplanes have very much allowed towns and cities like Kodiak, Fairbanks, and Juneau, each sitting in a distinct geography, to form what would be known as one region, Alaska. Then of course air travel has served as a way for people from the contiguous part of the nation to grow familiar with the state. I do have an Alaska Native colleague who does research into aviation's role in Alaska and I find the field of inquiry very exciting. Will Rogers' level of fame surely set a precedent for those who came after him. He belonged to a trailblazing cohort of performers who started their acts on vaudeville stages only to get involved with the new industries of radio, TV, and film that would transformed their entire profession. Roger's was also a Cherokee Indian writer and performer, one of many who would rise to the level of celebrity in American life. His influence can surely be seen in the work of Cherokee performers like Keely Smith and James Garner. 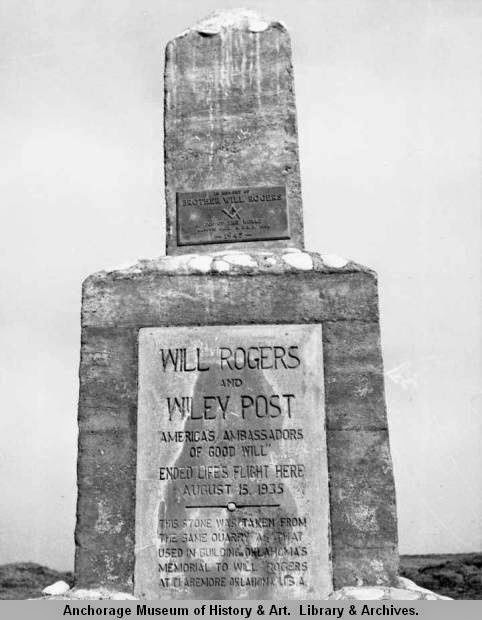 Below is a photograph of a monument erected in honor of Rogers and Post in Point Barrow, Alaska. The airport there is named in honor of the two them.